Stoke are in negotiations to sign Burnley striker Sam Vokes. And they could use former England striker Peter Crouch - 38 today - as part of the deal. 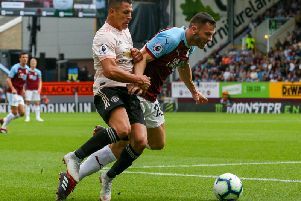 Vokes has found himself down the pecking order at Turf Moor of late, with Ashley Barnes and Chris Wood preferred up front, and he appeared to be saying his goodbyes at full time at Old Trafford on Tuesday night after the 2-2 draw with Manchester United. But new Stoke boss Nathan Jones is keen to take the 29-year-old to the bet365 Stadium, although the Potters are not thought to want to pay the £9m reported asking price. Vokes won't be allowed to leave without a replacement coming in, and Crouch could go the other way as a makeweight, with Burnley also keen on Birmingham City forward Che Adams - although Blues boss Garry Monk said last night: "The speculation is there but the club are on the same page as me - we can’t afford to lose our best players."